Inventory We are a resale marketplace, not a box office or venue. Ticket prices may exceed face value. This site is not owned by Fox Theater Oakland . The Fox Theatre Oakland has been one of the premier venues on the west coast since its opening in 1928. 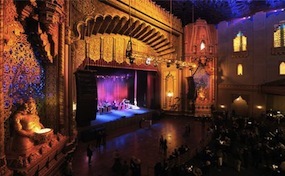 The Fox Theatre in Oakland is listed on the National Register of Historic Places and has a 2,800 seating capacity for all shows. The Fox Theatre box office is located at 1807 Telegraph Avenue in downtown Oakland, California. The Fox Theatre has been restored a couple different times but most recently reopening in February 2009. Some of the most popular Fox Theatre tickets have included acts like Bob Dylan, The Allman Brothers, The Moody Blues, Jeff Beck, Keane, Seal, Alice in Chains, and Green Day. TheatreOakland.com is not affiliated with any primary box office, supplier, or official website. We are an independently owned and operated company that specializes in online sales in the secondary market. Ticket prices may be above or below face value and will fluctuate with the market. To order tickets for all Fox Theatre Oakland events simply click on the performance of interest or pick up the phone and call our operators at anytime.